By Kathy Shea Mormino on April 21, 2013 Visit Kathy's Website. One of the lesser known symptoms of being a chicken addict is an acute fascination with chicken coops. 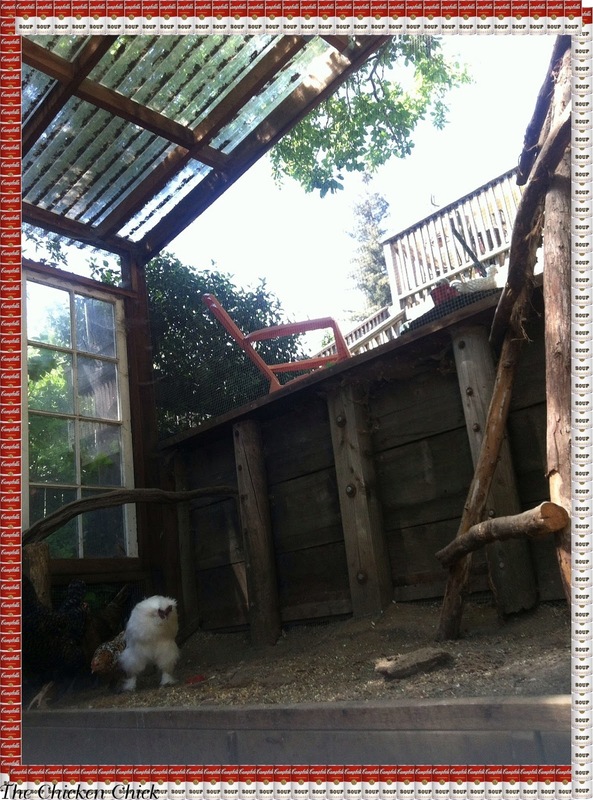 I freely confess to being a chicken coop looky loo and know that I am not alone in my fervent interest in the endless variety of coop styles, construction materials, designs, locations and layouts. 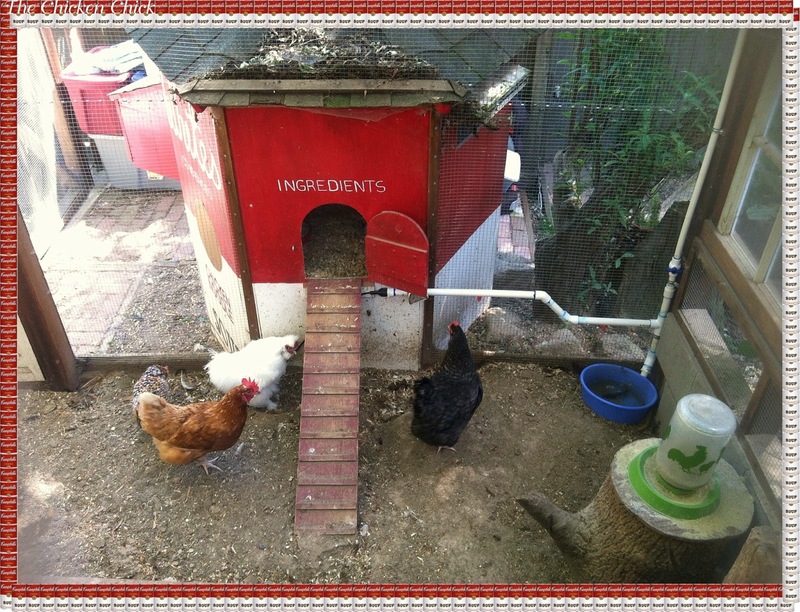 To feed the shared curiosity with other chicken addicts, I regularly host chicken coop photo contests on my Facebook page and frequently update my personal Virtual Tour de Coop of my own backyard chicken coop village. 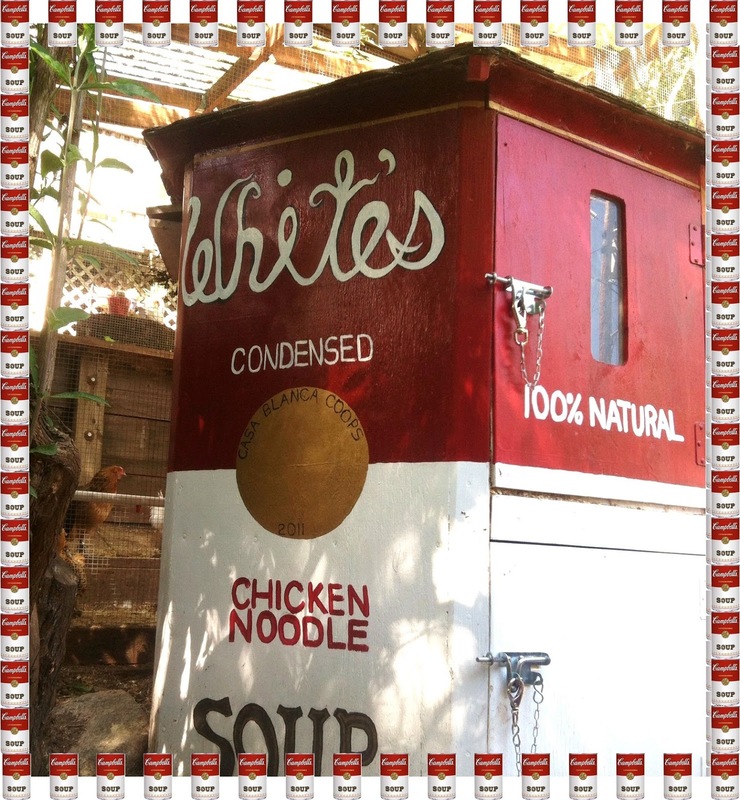 In my recent Chicken Coop Photo Contest, the White family of California entered a photo of their truly inspired and unique Campbell’s Soup Chicken Coop. I wanted to know more about its history and layout and Chris White graciously agreed to share her family’s story. When the Whites moved into their current home, their property was too small to bring their pet goats and they missed having non-traditional pets. After biking in the Tour De Cluck chicken coop tour in Davis, CA, and seeing how personable and friendly the chickens were, Chris was certain she wanted a flock of her own. She purchased some chicks from a local feed store and her quest for a non-traditional, fun coop design using upcycled materials began. The property is sloped with the house at the top, a middle yard with a patio overlooking the lower yard. Since the coop is the first thing you see when walking onto the property Chris and Steve wanted it to serve as functional garden art. After scanning the free section of an online classifieds website, Chris came upon a hexagon shaped dog pergola and was instantly inspired to create a soup can themed chicken coop. 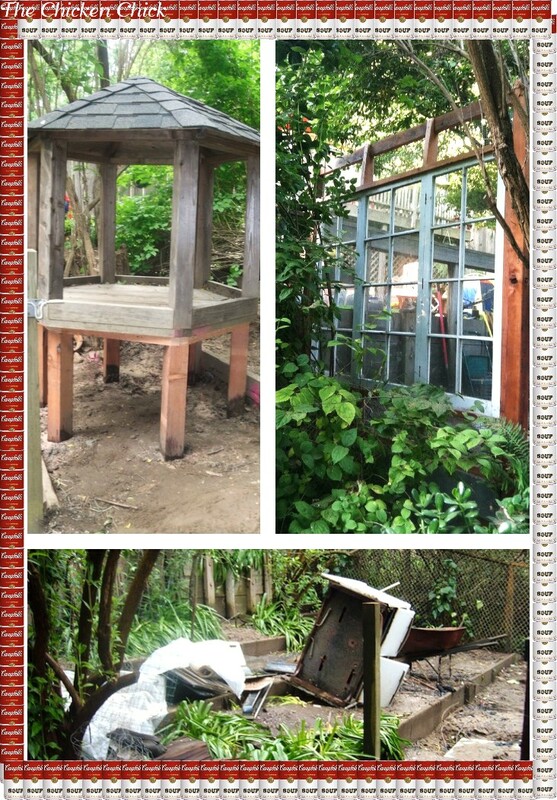 She also found some old, ten pane windows, which became part of the chicken run. If you’re building your own chicken coop, you might feel a little intimidated. Don’t. With some basic woodworking skills and a lot of patience, you can build a great coop that will house your girls comfortably for years to come.Just check this link http://www.youtube.com/watch?v=RlxalBhSRgA you will learn how to built a good chicken coop.. I love it! Talk about a conversation piece! My husband is already threatening to move me out with the chickens if I come up with anymore coop ideas. That coop is ADORABLE! I want one!! Love it. Thanks for the chance to win the giveaway too! 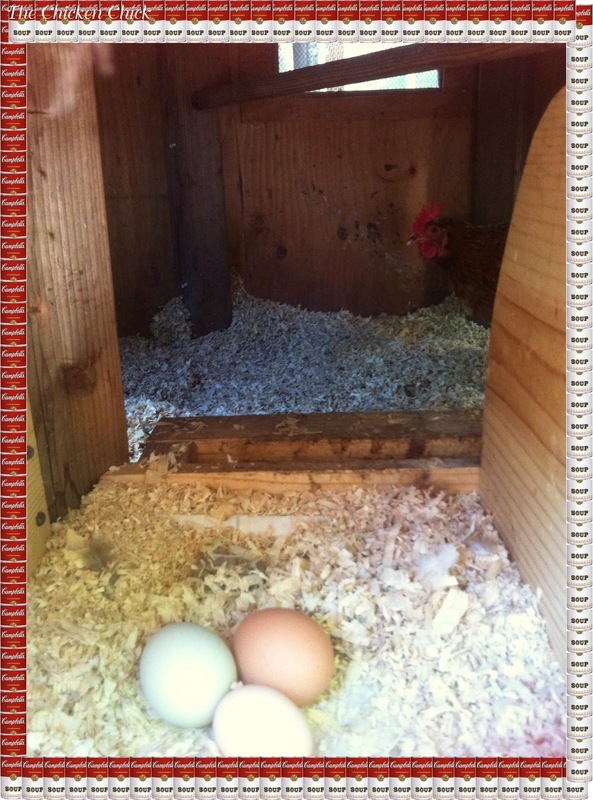 Melissa Reagan — Loved the ideas and the time that went into this chick coop! Love that coop! And thanks for all your drawings and advice! Very Nice Coop…I have many designs of coops…what one to build next…Hooked On Coops For Sure !!! Oh my word! I LOVE how creative people are! I think this is the coolest idea. And I am so thankful to find all these chicken lovers on facebook….I can honestly say I have given up my shoe addiction for a chicken addiction! AND it is less expensive!! : ) Thanks for all you share! Having chickens: is it an addiction or an obsession? hmmmm. Beautiful coop! Thanks for sharing. I love this coop. Thinking our next coop will be themed. love it…What a imagination. I’m so glad I became addicted to chickens, their so much fun. Beautifully done and very creative. Love the “Ingredients” over door. Love the coop! Happy to see Steve and Chris sharing their love of chickens with their son Hayden! it is always fun to see creative coops. Love a chance to win! This is a very cute coop! Cute coop. I don’t know how people find all these free materials to use. My girls would love to win some feed … Thanks for the opportunity ! csconrad@yahoo.com This is one great coop! Beautiful Coop. The ideas are endless. Very cute! I’m still looking for that special coop design to catch my eye! I need to figure it out soon, though, because my chicks sure are growing fast! Coming up with a perfect coop is just half the fun of having chickens, great job! I love coops with character. Thank you for the inspiration. Love the coop!and Im addicted to chickens! !LOL!cant get enough of them.they are sooo much fun to watch and are very sweet! so cute, i love getting new ideas for coops, my husband on the other hand doesn’t since he is the one that has to build them, but secretly I think he loves it because he is always adding special little touches. I love the design of the outdoor area with that coop! Very cool!! 🙂 My girls would like living there…. lol! cool. like it. wish i could be crafty, but i am not. Love, love, love this coop – great and ingenious use of recycled materials! I love that coop! The Soup Coop!! Too cool! That is awesome! I’m going to be painting one of our coops in the next couple of weeks…it’s getting my creative juices flowing! I love creative coops. This one is great. Thanks for the chance at the giveaway. This is a cute idea! I love that coops have fun paint jobs. 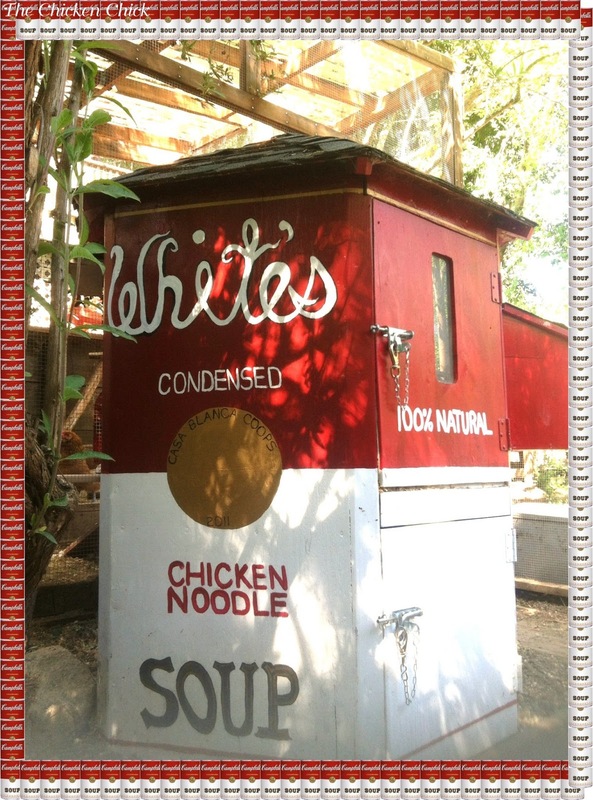 Love the Ingredients in that chicken coop… Love the whites chicken coop..
Well done!!! Great design, happy healthy chickens! Such creativity – Love it! Who doesn’t want free feed??? Sign me up! LOVE this coop idea!! Thanks for all you do! Thank you for this giveaway! Neat coop! Like the cute coup. We have backyard chickens in a rather traditional coup. It does have a metal star with a chicken on its front. Our chickens would love some Nutrena chicken food. I can say I LIKE you and your blog a lot, but I DON’T LIKE Fakebook. Would love a chance to win the chickie food less the FB; such is life. I just got my first 2 girls (almost a month old) and I will be decorating their home as whimiscal as mine! What an adorable coop! I really like the set up they are using. I love the coop. Andy Warhol would be proud!!!! I love looking at chicken coops! Mine isn’t pretty, but it does the job. Wish I had $ to redo it! LOL! Cute, Cute much-needed upgrades! I’m raising backyard chicken and love it. Would love to win the Nutrena Poultry Feed. Love the coop..always great idea’s on your blog..Thanks for sharing..
Love the coop Ideas. We need to build another one for the new chickies we have. Also love Nutrena feeds! Too Cute Coop. I like the names to. I brought home two baby, one white one brown. My hubby thinks it’s cute to call them white meat and dark meat. 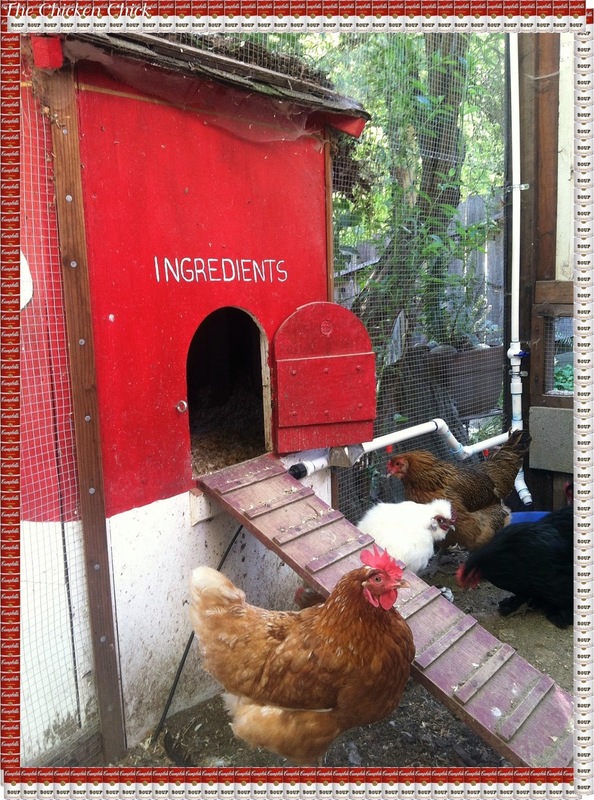 I am looking for materials to upcycle into a coop for my girls. Things are pretty basic right now, but am inspired by creative ideas such as this one! Very unique and nice. I like mine, “The Chick Inn”. What a clever idea..so creative! This is such a cute design & love they upcycled something that may have ended up in a landfill. Really creative ideas! the “ingredients” are my favorite part!! Love this chicken coop! It inspires me to improve my purely functional setup! I love the information that is provided on your facebook. I am new to the whole Chick thing and this has been a great source of information. I would also love to win the feed. That would be awesome! love those coops. very creative. Such an inspiring coop design! The ‘Ingredients’ over the door is much too funny! LOVE the campbell chicken coop, soooo creative!! 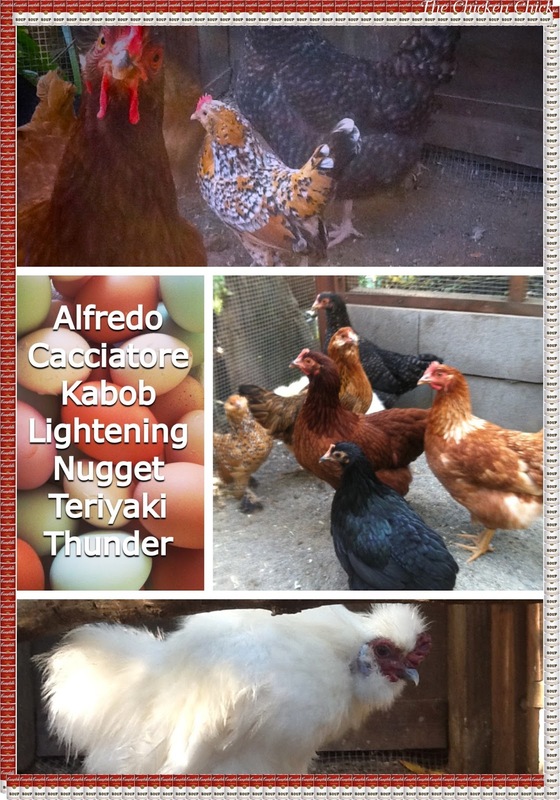 We are brand new to the world of bakyard chickens and have learned so much from your blog. Thank you so much for all of your insight and inspiration! Love the coop !! I was looking for ideas for a new coop we have to build this summer. Might do something like this !!! I totally have coop envy. I want a new one so bad! Very humorous & creative idea…way to go White Family!!! I just really need that feed! Love your site ! Thanks for the chance to win ! Love the coop. Just received 8 bantam chicks from mypetchicken.com today. Love my chickens. Wow! What nutcases! I love it. And you are right there is a massive market of chicken coop lovers. Is there a 12 step program to enrol on? I have shared this article on my Facebook page. What a great coop. I am getting a flag for mine next week and starting on a new one. Would love a bag. of my favorite feed! Really could use the help of the free feed that I already use, love Nutreana Feeds, its all I use. Healthy chicks, healthy roos, healthy hens with great size eggs. Love the coops; would love to win the Nutrena Poultry Feed. I too have a “coop fetish”!!! I love looking at coops!!! 100% natural is my favorite part of their chicken soup coop!!! LOVE IT!!! Would love to win some free feed! We just finished our coop a few weeks ago & have 2 girls living in it. Three more to move out of the house in the next few weeks. What a cute idea! I am tempted to drag out my tools and do some much-needed upgrades! We just finished our coop this month..I love it but its no where near as creative as this coop is!! 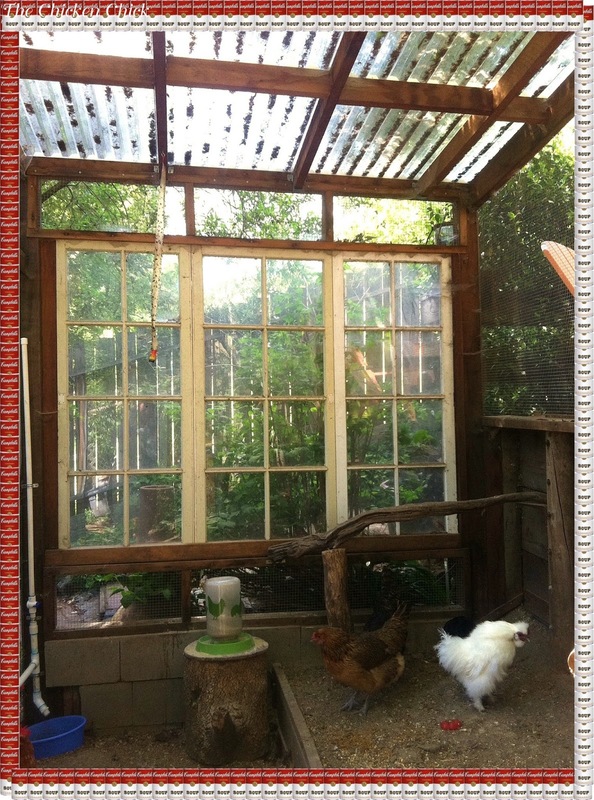 A truly inspired idea for a chicken coop. Very artistic. Good luck to everyone on the giveaway, and thanks for continuing to have them!! Would love to win some feed….my girls are almost ready to come off their starter! Wonderful to see new ideas for chicken coops/runs. Working on a new one and still not sure what I really want to do. 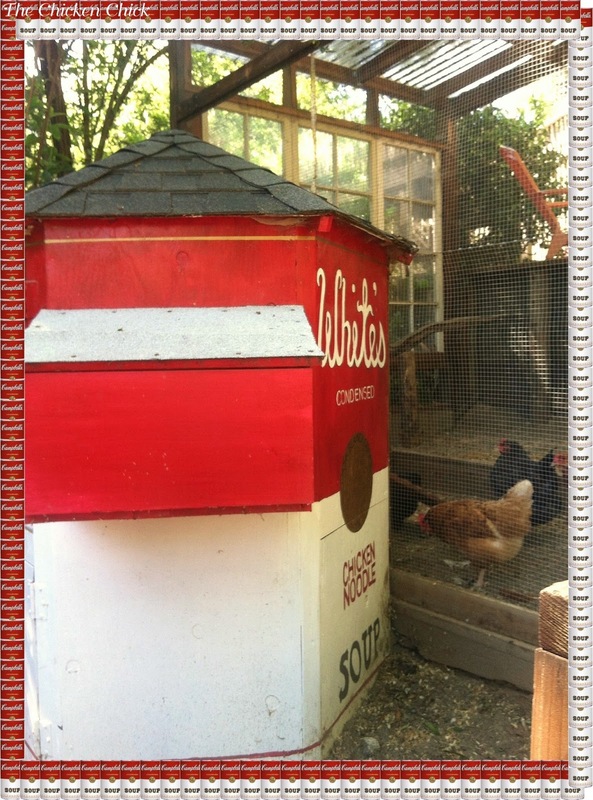 Now that is an inspired chicken coop! Very cute, but a little small, we have a much bigger family of chickens, who also share their open area with the resident ducks. Lucky chickens! 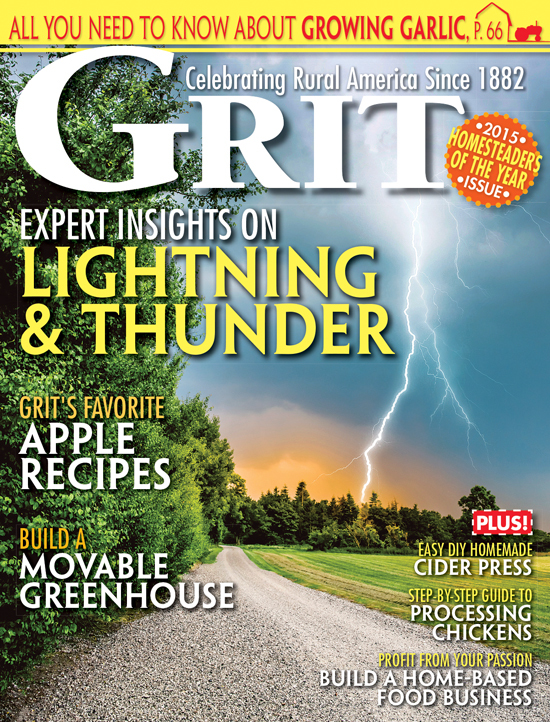 Great article…Thank you! The best soup/coop of the day! A real eye catcher, a well built home for your brood. Perfect size for our yard. Thank you! What a great idea; not only is it adorable, it is very well predator-proofed and designed. Love it! I hope this is where I’m supposed to leave the comment. ????? I kept going over to the FB page, but didn’t see a place there. I like your site. Love the coops. Adorable chicken coop. Shows a great sense of humor. What a fantastic way to express yourself and house your pets, White family. Now I really need to think about how to build my coop. Very nice coop. Those chickens must feel like there in a million dollar palace. Beautiful artistic lay out. 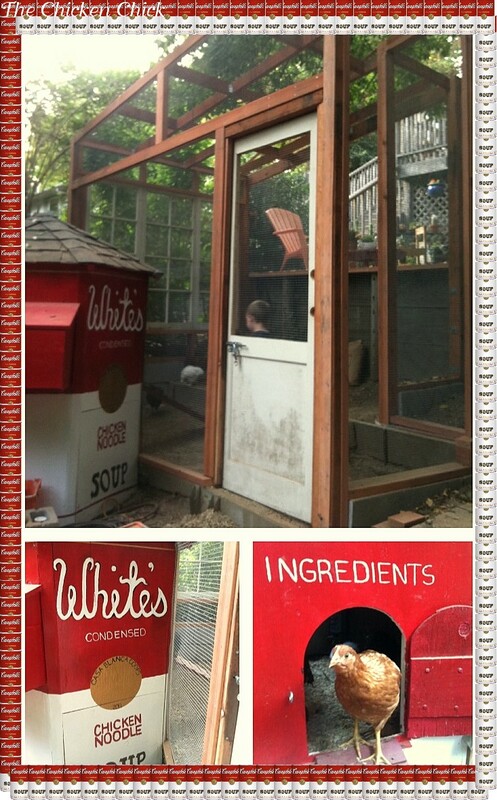 What a fun idea for a chicken coop! LOVE IT! What an awesome coop! Thanks for the great photos & info! I always check out your FB page & blog! Keep up the great work! All these small coops are cute but would like to see a large coop (50 birds) done up cute. Should have them put organic in with the ingredients. Love repurposing. My coop isn’t very creative but it’s all new to my ladies. Campbell’s chicken soup awesome! Love the coop. Mine is just a thrown together sort of thing. I just built a new coop for my new chicks last year but it is not as unique as the soup coop. I do not have a facebook account yet. please enter me for the give-a-way anyway. please keep showing these different coops. Awesome coop. Mine’s not nearly so artistic, but it’s still functional. 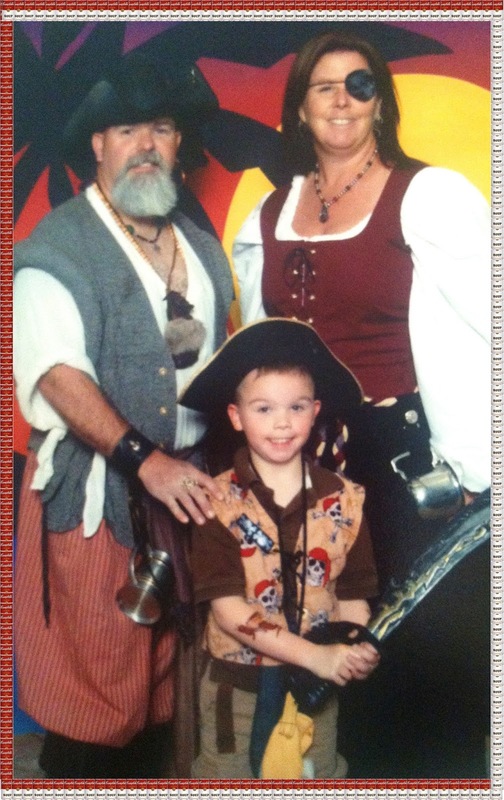 BTW, LOVE the pirate picture! Great coop! What an imagination! Very cute. Not sure I would ever go that far but nice to see. Shade of Andy Warhol! What a great idea. Love the coop!!! What a pretty yard that makes! What a neat idea, I would’ve never thought of this. That may be the cutest coop I’ve ever seen! I like the solar coop! Enter me in! Oh, my. I’m afraid I may be a chicken addict. I have “pinned” many a coup. Cool! I just got my first chickens last weekend 6 hens!! I love to see other chicken coops, too. In the instructions above, what is instruction number 2? Beautiful and original coop idea! I love it! My daughter would to have this coop! Love the soup can coup idea… I am also a “coup watcher” as I love to see creativity in design mixed with function. Thanks for sharing! I like coops like this that serve multiple purposes. Thank you for sharing. This coop is so cute and creative! Oh, how cute. Looks like someone had fun making this. 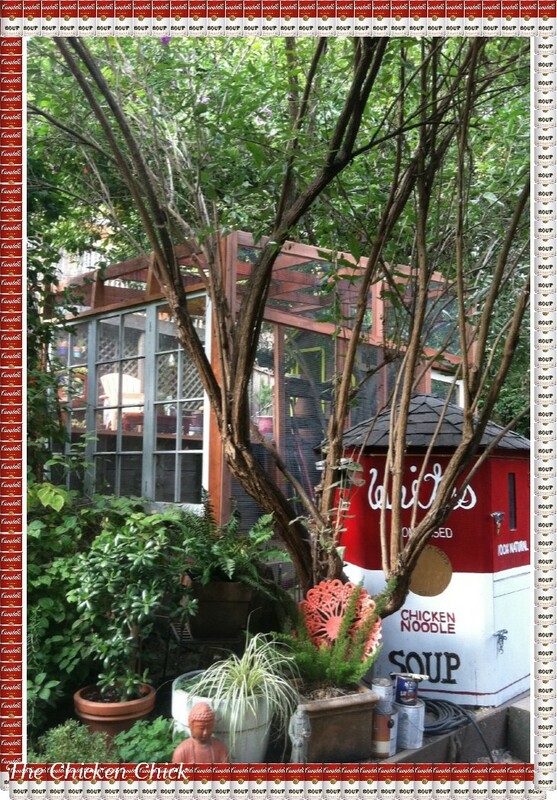 Loved the chicken noodle soup coop. Very unique and creative. I wish I had more creativity in my makeup. Also love the chicken chick! Thanks for a ton of good ideas, advice and contests. What a great coop idea, I love it! I also love how their run looks and around the coop they have done a beautiful job decorating it! I am also looking for safe plants to plant on the outside of my run area. I would love too see a blog about that sometime! Comfrey! They’ll eat it to the ground if you don’t protect it! That is too flippin cute. I too love to see other coops. More than I like to see houses. The whole chicken area is really nice. Although I have a few misgivings about using the chicken noodle soup idea…..I guess as long as the chickens can’t read…. I love the coop. What a great idea! What a cute coop! I wish we had been more inventive when we made ours. I just love your chicken noodle soup coop!! It is too cute! Great coop. I’m raising backyard chicken and love it. Could always use feed for my brood. I love that the coop says “Ingredients” above the chicken entrance! My coops are in bad need of a paint job, and I’m very tempted to do something cute like this.